Since using Marsello, NaturallyCurly have seen an increase in sales by 6.7%. They are sending personalized product recommendation emails. NaturallyCurly is a lot more than a gorgeous online store, it's a passionate international community. Originally starting as an online discussion board, NaturallyCurly is now a powerful platform that includes everything a curly-haired lass or lad needs. Customers can share stories and photos, find the best stylists and salons, and seek helpful content and reviews, as well as shop for the best products and brands. They recently added their NaturallyCurly Rewards program to their online store. They reward their members for every purchase, as well as for helping grow the NaturallyCurly community. Customers who sign up to the rewards programme are also able to leave feedback on products; this engagement has become a huge part of what makes the NaturallyCurly community keep coming back. 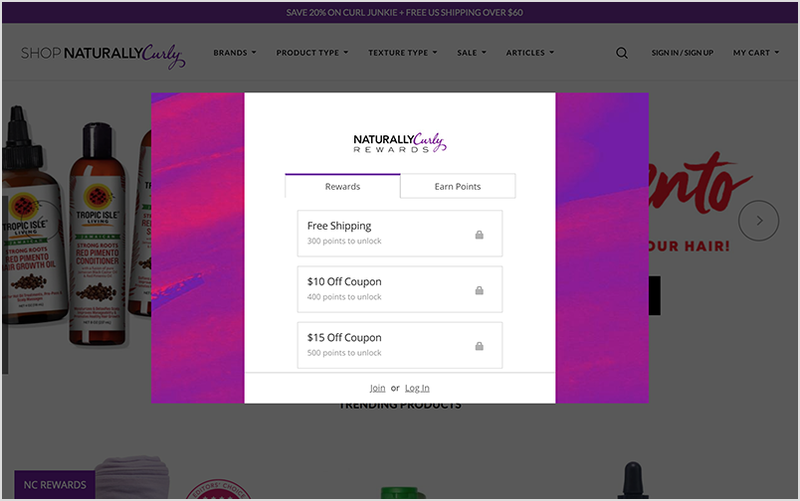 NaturallyCurly's rewards program info page is stylish! It's a simple block layout, which makes it easy for customers to read and understand. One of NaturallyCurly's main goals is to continue to grow their community and keep their community engaged. They've listed their options for earning points on their info page, making sure that their members know they can earn points by sharing their store. NaturallyCurly has a beautifully consistent color pallet and branding across their entire store, and their reward program is no exception. They've customized their loyalty widget to make their reward program immediately recognizable as their own. NaturallyCurly has created an amazing community and their forum-like hub, Style Nook, provides a place for their customers to share inspiring stories, photos, practical advice, and more. The NaturallyCurly community stands out for its involvement and supportive structure and we love they way the NaturallyCurly team have curated their marketing to suit this. The NaturallyCurly revolution doesn't stop there – the community is so engaged that their product reviews are often in-depth, letting other NC Community members know how products work best and tips on how the product worked best for different hair types. Other community members can even 'up-vote' reviews that they find useful, and they use this function regularly.